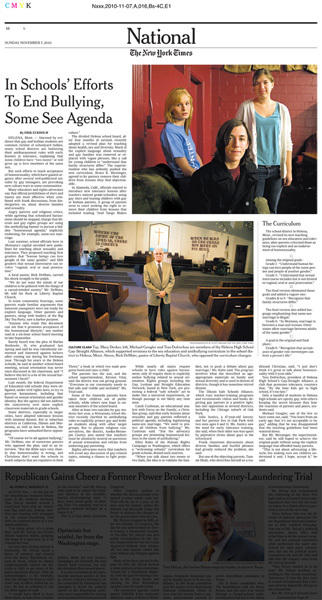 In Schools Efforts to End Bullying, Some See Agenda - New York Times, Nov. 7, 2010. My thanks go out to Darcy at the New York Times National picture desk for calling me a few weeks ago to cover an interesting story brewing in Helena, Montana, on the subject of changes to the school district’s curriculum guidelines regarding sexual education, anti-bully measures, and issues relating to homosexuality. You can see the story on the New York Times website. The shoot was challenging for a number of reasons: the main action of the story had happened a month before the shoot, many players in the story were unwilling to be photographed or go on record, many were unwilling to meet anywhere but a bagel shop (one subject wouldn’t let a New York Times reporter in their house), school was out of session on the scheduled day of the shoot, the superintendent, who was the driving force behind the curriculum, was unavailable for pictures. Nevertheless, I feel the shoot was successful. I’ve also posted a few of the outtakes in the recent work section of this website.